New Orleans area Fellows are invited to join Advancement Director Hannah Hanford for a mini Fellows Reunion, Monday, March 30, 6 p.m at bar at The Columns Hotel, 3811 St. Charles Ave. See you there! VCCA composer Craig Urquhart will perform selections of his work, accompanied by VCCA poet Jan Freeman on Thursday, March 26, 7:30 p.m. at Klavierhaus, located at 211 West 58th Street in NYC. Email Craig for more information and reservations. Composer Alex Vella Gregory, who attended the VCCA as a Malta exchange participant in 2008, performed work written at Mt. San Angelo on March 7 at the St. James Cavalier Center for Creativity in Malta. On hand for the performance was VCCA Fellow, Olive Ayhens, who is currently on the Malta exchange. 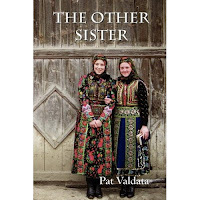 Pat Valdata will sign copies of her book, The Other Sister, the story of three generations of Hungarian women, on Saturday, March 21, from 9 a.m. to 4 p.m. at the Omni Hotel, as part of the Virginia Festival of the Book. She worked on this novel during her 2006 residency and it was here that she did the final revisions. Now living in Elkton, Maryland, Pat is also the author or Crosswind. Click here to listen to Pat talking about The Other Sister on YouTube. Christine Hale's first novel, Basil's Dream, has been published by Livingston Press of West Alabama. 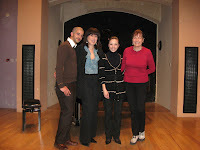 Her third residency, in 2005, was instrumental in completing the book. "VCCA's paths and vistas calmed the author during more than one revision of this book," she says. Set in Bermuda, the book follows the story of an American family living abroad and their entanglement with one of the country's opposition leaders. Read an excerpt on Christine's website. Book cover courtesy Christine Hale. Brooklyn artist Anki King will exhibit her drawing and painting series "Sisters," based on her experience as the oldest of three sisters, at Trygve Lie Gallery in New York City, with an opening reception on Thursday, March 12, 6 to 8 p.m. The exhibition will be on view through April 26. Part of this work was created during Anki's VCCA residency last fall. Anki will also exhibit in a group show "Darkness Descends: Norwegian Art Now," during the Armory Show, March 5-8. In connection with this show, she will open her studio, in Long Island City, for visitors on March 6th, 2-8 p.m. For details, visit her website. 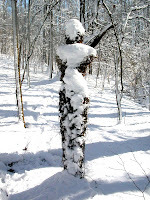 During her VCCA residence last fall, Anki also created two site specific sculptures on the VCCA trail, one of which , "Vine Woman," is pictured here, after the early March snowfall this week. This work is also being featured at the International Museum of Women.